That�s right boys and girls, I�m done with this project�for now that is! At the next opportunity I need to gather more recycled metal for the side wood rack�for another winter project. Spring is here, the striped bass is running strong and now is time to wet the boat and go after them. 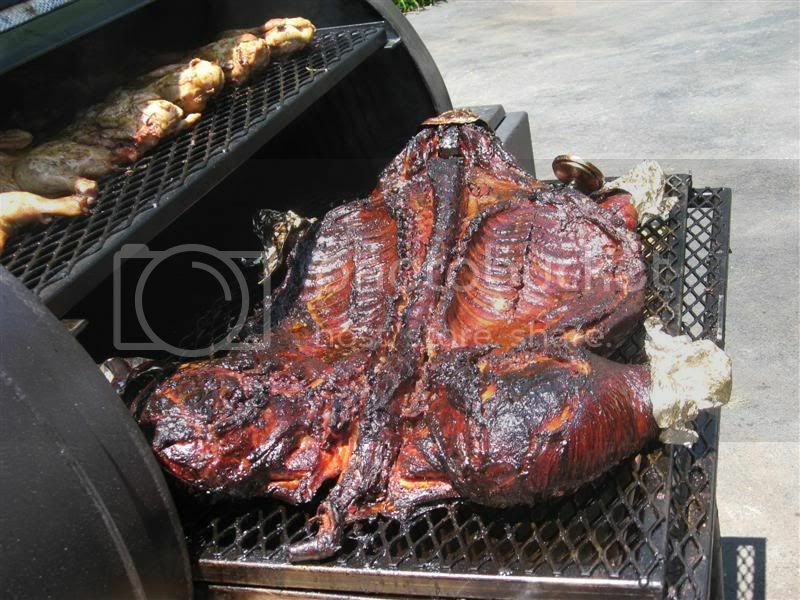 In the meantime, I must share with y�all my first pig roast adventure for memorial day� I started planning a 40lbs pig and ended up buying a 70 lbs pig�why? Just because I COULD fit it through the 38� door opening, that why! Also I felt very confident with all the help I�ve gotten from this site and mainly, the endless personal advice from Mutha Chicken BBQ AKA Dan Mc. Thank you very much Dan, thanks to you I've successfully roasted my first whole pig. 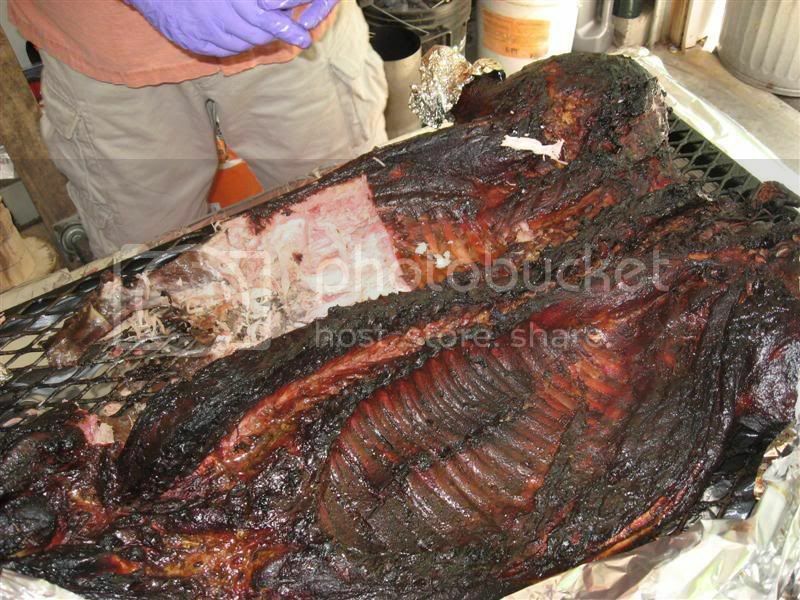 Started by injecting the pig with a typical pork injection recipe and applying a nice pork rub on the inside (both recipes from here)� Heated the cooker with twigs and wood splits at about 9:30 pm Sunday night, at 10 the temps were up to 270*; dumped two bags of charcoal in the basket and loaded the pig in the cooker skin side up for the first 4.5 hours cooking at 250*, at 02:30 my son and I decided to flip and rotate the pig, we did that� how? 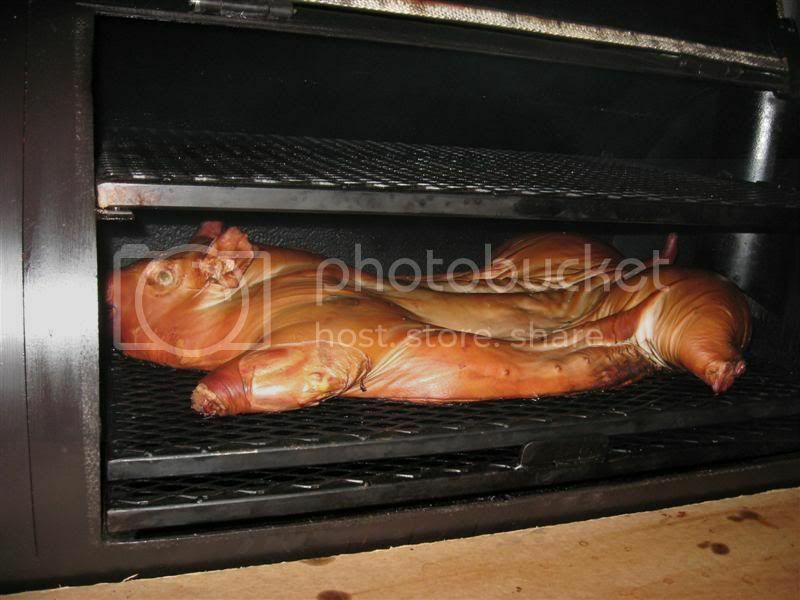 Well, I had the pig on a second cooking tray (from the left side of the cooker) which purposely measures 37� wide (one inch smaller) This made rotating the 70 lbs pig a breeze. At any rate, at that time the internal temperature on the hams was already up to 130*, I wanted to serve the pig at 2pm so I figure we had plenty of time to cook it at lower temps. We set the temps at 200* for the following three hours and at 225* until the hams and shoulder temps read 180* after that we cooked at 250* and at 275* between the 190* and 198* mark. After many years of wishing we finally hosted our own pig roast party, which was fun and amazingly rewarding. Nice,awesome looking job on the cooker and the pig. Is that chicken over the pig? I'd watch that practice if I were you. But latern does bring up a good point, Might want to keep that chicken over the otherside of the cooker, So nothing drips on the Pig. And that cooker looks Fantastic, Noce Job on that also! Great all the way around! Nice unit and very nice looking pig. Great work on that unit. Have some fun with that thing! 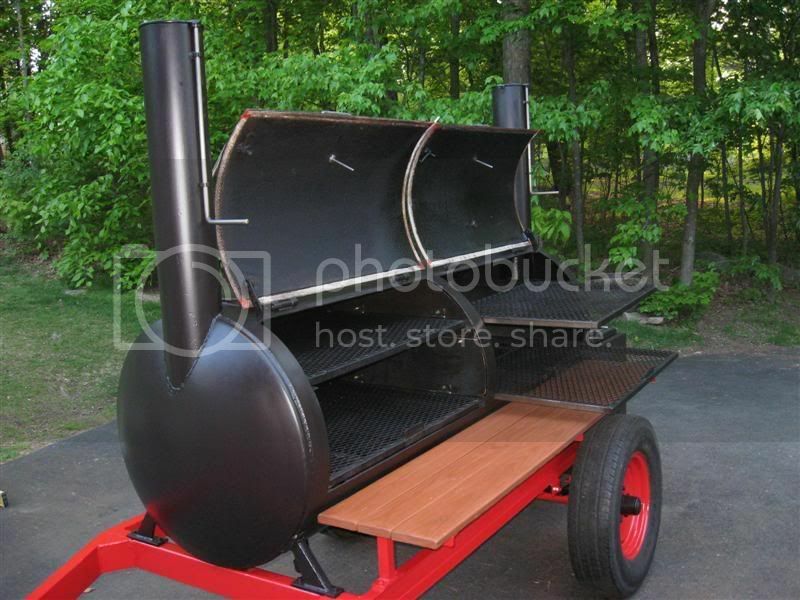 Great looking pig and cooker. Awesome job. I like the red and the redwood shelf. Fine job on the cooker and a good job on the hog!!! 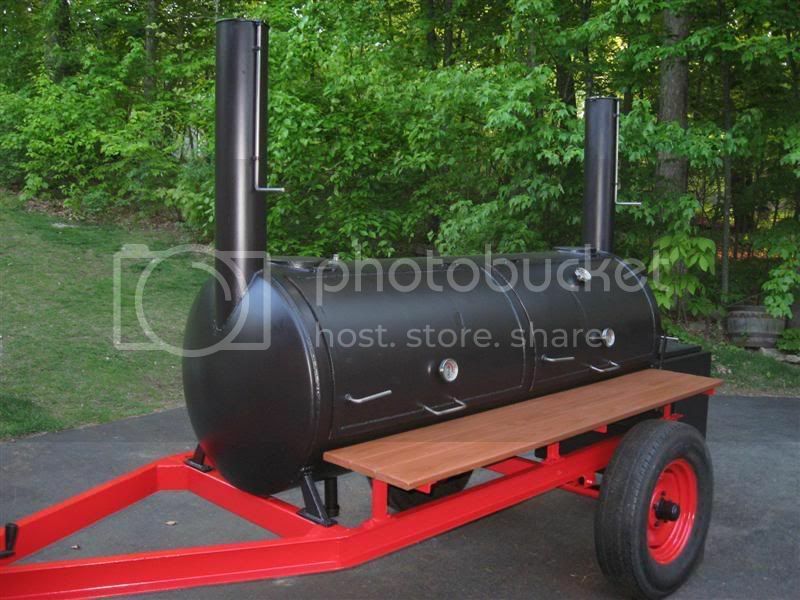 I really like the Red with your smoker....nice touch. Hog looks awesome...is it wrong for me to crave ribs at 7:45 am? Great pics. Nice Job on the rig & pig. The rig turned out great... and the food looks mighty appetizing as well. Really looks great all finished and painted. And that pig looks awesome. Nice Job on both the smoker and your cook. Looks like you had a nice day for it. I like the colors you painted the pit. I'll do just that Chuck. Hopefully in two weeks, striped bass is not the best fish for the smoker, done right however it makes a heck of a meal. 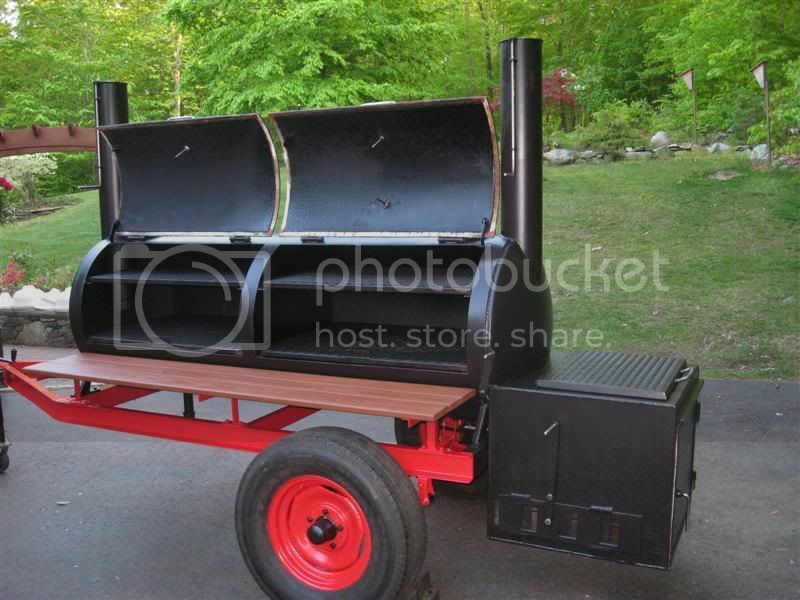 Great job on the cooker JoeD, I also like the red trailer nice contrast. The cook turned out awesome that pig had me Drooling.